You may have noticed that Chris and I have been making a lot of chairs recently. In the past few months, we’ve made a few incremental improvements and changes to our processes that make charmaking easier, more accurate and more enjoyable. But now, we think we’ve come up with a tool that will revolutionize your chairmaking process – and rather than just write it up, the millennial-in-residence (that’s me) decided to make a flashy video to share our innovation with you. So, please enjoy the video below about our latest innovation, the “Chairmaker’s Sighting Square” – and scroll past the video for the necessary files to make your own. 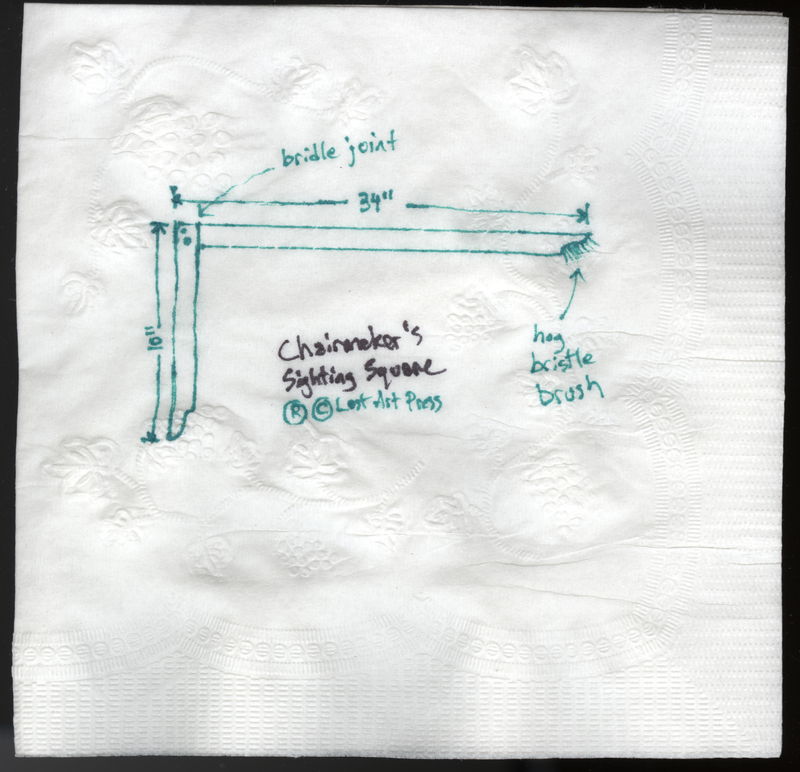 The Chairmaker’s Sighting Square from Christopher Schwarz on Vimeo. Is it April first already? Can I get it in a left handed version? Simply outstanding! Naturally I assume I will need to raise my own piglet into a hog so as to harvest organic, sustainable hog bristle. Which begs the question of which part of the hog yields the bristle? Also, is there a best practice methodology for harvesting hog bristle? After downloading all your free plans, drawings and templates I would like to attend a class in your shop on building this device. However, I would much prefer it be one on one so as not to be distracted by others during my learning experience. Looking forward to your immediate response though my tongue seems to be firmly lodged in my cheek. As any child who has sat through story time knows, the bristle is collected from the chinny-chin-chin. For version 2.0, if you attach a plumb bob you will make your boring friend’s job a lot easier and more accurate. Also curious as to why boars hair and not the hair from you boring friend? He seems to have removed a lot recently. Looks good by the way. Makes the beard look spiffy. Somebody has way too much time on their hands. What the heck were you drinking at the time you hatched this one? And where can I get some? Is there one for left-handed people? That was almost as believable as the horrific exploding workbench! Freakin Brilliant!!! I now must make a chair just to build and use this contraption. Can I have my four minutes back? Just completed mine – I could not find a cheap source of boar’s hair so I substituted chicken feathers…. and I don’t have a friend. Thank you, I was going to be very disappointed if this wasn’t *that* video. Nice antiquated version of this tool…I just got off the phone with Lee Valley, and they will be working with Woody Woodpecker to introduce The Improved Chairmaker’s Sighting Square (TICSS), assembled by the newest in C&C machining and laser-guided robotic assembly using a combination of O2 tool steel, 6061 aircraft-grade aluminiuim, and will be adorned with the latest technological carbon fiber fibers to re-revolutionize this revolutionary tool, unearthed from an ancient Atlantisian text on woodworking, who also invented sitting. I laughed so hard… was not expecting this so far from April 1st. Brilliant. Useless! Unless of course you can also invent a buddy for me. Enjoyed this video. Brendan looks good in the rose shirt. It goes nicely with the other good looking woodworker in the black shirt. I think his name is Christopher Schwarz. Brendan – funny video, thanks. Re: the Fir you used. I have a ton of similar stuff laying around, and didn’t realize it would be good for tool making. Haven’t imagined using it for a plane or tool handle, which doesn’t sound quite right to me (but I’m probably wrong). Beyond squares what tools would be good to make with it? Straightedges, chair sticks, rulers, squares… good for stability in measurement. You’re correct in thinking it may not be so hot for totes and handles, I believe. It seems this video marks the divergence in which this institution has evolved from its individualist-anarchist roots into its more communitarian present state. Build by yourself? No, build with a buddy. Or comrade, if you will. I won’t bother making one as they are selling an electronic version in Harbor Frieght for only $5.99 plus tax. It is more useful than the wooden one as you don’t need a buddy to assist.